Little is known about the life of Nathaniel Waterhouse (1586-1645), up to his marriage to Dorothy Wilson in 1607, but they had no children. He prospered as a merchant and salter, selling salts, oils and dyes to clothiers and gradually built up his fortune. During his lifetime he gave property off Upper Kirkgate for use as a workhouse for the parish poor and in 1635 a corporation charter was obtained whereby it was to be run by a Master and twelve Governors. By his will of 1642 he additionally established almshouses for twelve aged poor persons from Halifax Parish (exclusively women from 1732) and a school for twenty parish orphans (later known as the Blue Coat School). The Almshouses and Blue Coat School were rebuilt on Waterhouse Charity land in Harrison Road from 1855 at a cost of £8,469 13s 7d . The school operated until 1959 and after four years was then demolished along with the Almshouses. The present 24 Waterhouse Charity Homes were erected on the site c1967. This collection comprises 24 boxes deposited by the Trustees of the Charity which still flourishes today. 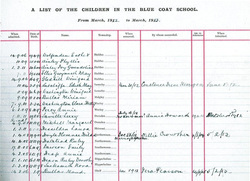 The collection includes minutes 1777-1956, accounts 1610-1998, Headmaster's report books/log books 1891-1956, and a register of widows in the Almshouses and children in the Blue Coat School 1907-1963. There is also a Civil War pass from 1643 issued to Nathaniel Waterhouse desiring all commanders and officers under the command of the Earl of Newcastle to allow Waterhouse to come to Halifax with his goods. The records are available to view on our ﻿online catalogue﻿.